Traveling is a challenge at the best of times but it's especially a struggle during the extra hectic summer months. Flight delays, overcrowding, the restrictions on carry-on toiletries...it's enough to make you stay put at home. And then there's the suitcase equation. If you've ever had your luggage go missing, you know how miserable your trip can *really* become. There's nothing worse than having some jet-lagged passenger scooping your belongings from the baggage chute. Fear not...travel gurus Flight 001 have your case covered. 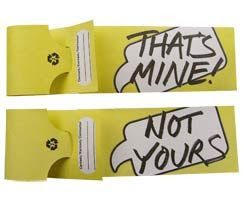 Check out these baggage tags -- that stranger in row 31B will make a second take before lifting *your* suitcase! (FYI -- for more travel-esque posts, please check out the 'travel' label on the left side of the screen). Oh wow, love these!! They're so cool! !